I needed a sympathy card this week so I came up with this using the stamp set Thoughts and Prayers. I love this set as there is so much you can do with it. My other supplies include early espresso cs, baja breeze cs, crumb cake cs and very vanilla cs. The ink and ribbon is early espresso and I added a little dazzeling diamonds to my tree. I hope it comforts the family members knowing that others are thinking of them during this difficult time. Thanks for stopping by. Happy New Year!!! 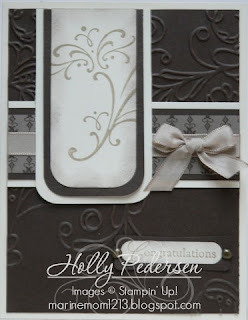 For this card I used the Stamping411 sketch for this week. The sketch was supposed to be square, but my sentiment was too large so I made the more common size of 5 1/2 x 4 1/4. 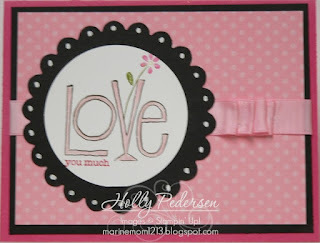 My stamp set is Love You Much and the paper is Melon Mambo, Basic Black, Whisper White and Pretty in Pink dsp. 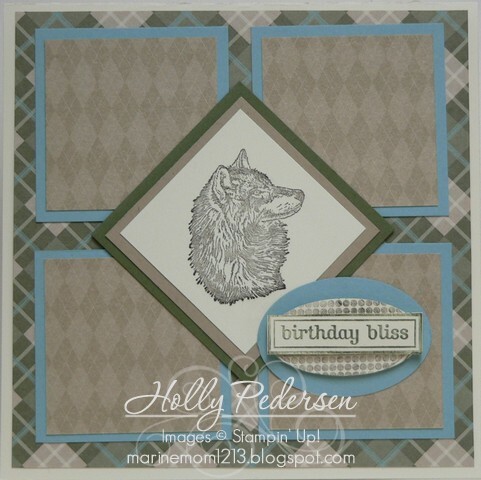 I used the 2 1/2 circle punch along with the large scallop from the scallop circles #2 die. A little white gel pen and Pretty In Pink satin ribbon finish it off. For this card I used the sketch from mojomonday and came up with this. 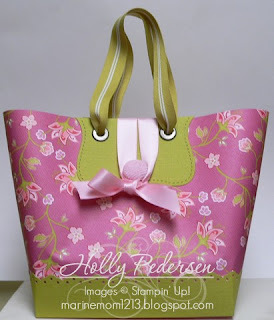 I used Very Vanilla and Pretty in Pink cs with the Love dsp and watercolor paper. My inks are Real Red (both classic and craft) and Pretty in Pink craft. My stamp sets are Love you Much and All Holidays. I have had the Lots of Love letterpress plate but had never used it before. I need a little practice, but I love the look you get with them. My final embellishment is Pretty in Pink satin ribbon. Thanks for stopping by - Merry Christmas. I made this card for a co-worker using the stamp set, Party Hearty. My paper is basic black cs, real red cs, newsprint dsp, and very vanilla cs. My accessories include the word window punch, modern tag punch, both scallop circle punches, 1 3/4 circle punch and the 1 1/4" stripped grosgrain basic black ribbon. 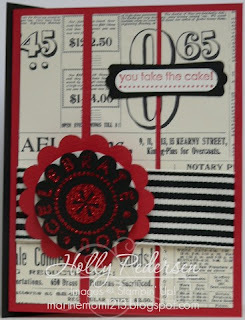 I also used some red embossing powder on the Celebrate You. Thanks for stopping by, have a wonderful week. For our downline Christmas swap I made this purse with 6 cards. The purse base is 8 1/2 x 7 scored at 1 1/2 on all sides, cut a slit in each corner to make a box. This becomes your base for the purse. Then take 2 pieces of dsp 6 x 10 and adhere together on one short edge to make one long strip. Wrap around base using red sticky tape putting the seams on the side of the purse. Then embellish and you get a cute purse. I made the cards out of the same dsp (Raspberry Tart, and Kiwi Kiss, both retired). 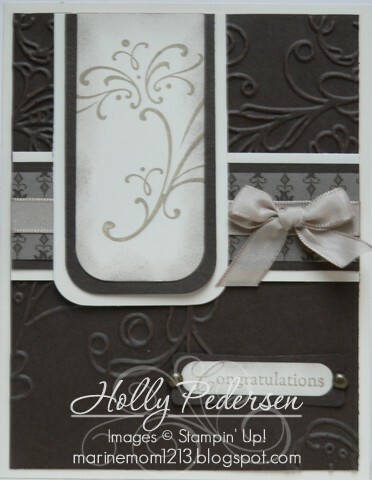 For these cards I used the sketch for Stamping411. I always need an idea for my card layouts and this is a great site to get inspiration. I used Blushing Bride cs and Real Red cs along with the dsp Candy Cane Christmas. The stamp sets are from Contempo Christmas and Teeny Tiny Wishes. 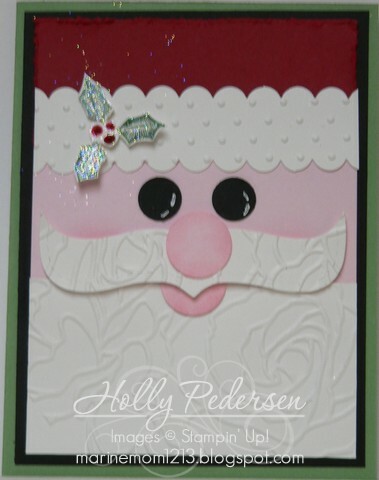 I used the ticket corner punch, pretty in pink ribbon, the 1 3/4" scallop circle and the ornament punch. I would say these are not "traditional" Christmas colors, but I am pleased with how they turned out. Thanks for stopping by, Happy Holidays!